I’ve been modifying e-Verne recently to make him a little more friendly to use on tablets and phones, particularly those running under iOS or Android (follow this link for tips). This has been in preparation for a Tutorial session I’m presenting at the GCMAS meeting next week in Portland. 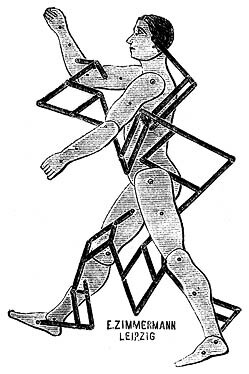 While I was doing the maintenance something reminded me of a picture in Braune and Fischer’s, “The Human Gait” (which was originally released in chapter form between 1895 and 1904) of a device to calculate the position of the centre of gravity of the whole body once you know the positions of the centre of gravity of the individual body segments. I scanned through through the book and this is the image that I remembered from page 127. The ingenious scaffolding mechanism moves the black spot in the centre to illustrate where the centre of gravity is. I thought it might be interesting to add this functionality into Verne and below you can see how it looks. Use the “Mass centres” button to toggle the centre of mass positions on and off. The individual segment masses are depicted in black. The red and blue symbols are the centre of masses for the different limbs (femur, tibia and foot segments combined) and the green one that of the overall body. The area of the symbols are proportional to the mass of the different segments with the masses and centre of mass positions for the individual segments based on the data in David Winter’s book. Drag on the different segments to move them around (there are more instructions on the Verne page of this blog-site. 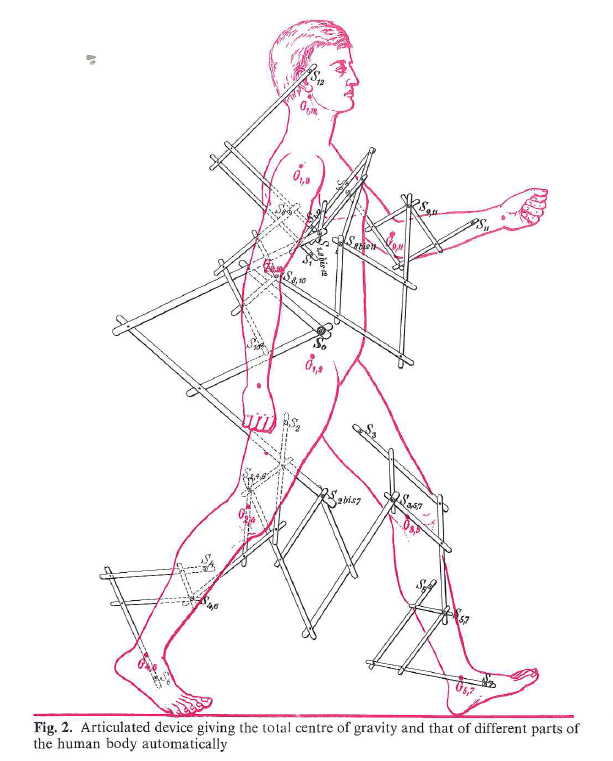 Whilst checking to see if I could save myself the walk to the scanner by surfing to find if the image from The Human Gait was already on-line I was fascinated to come across a similar picture. It’s from the catalogue of the German scientific instrument maker Eduard Zimmermann published in 1904. It’s labelled as a “Schwerpunktmechanismus nach Fischer”. They obviously sold well because they are still listed in the 1928 catalogue where a fuller description is available. It doesn’t say how big this was but it weighed 4.6 kg so much have been a fair size.